The Abu Wobbler Tormentor floating plugs are available from 5cm to 11cm. Trout, perch, salmon, pike, zander and bass have all fallen to this seductive charms. There is a Tormentor to suit all locations with a range of fish catching colours that scream to be cast to those fishy hotspots. 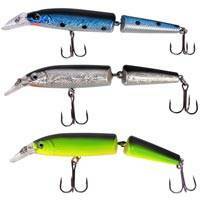  Ideal pike, bass and perch lure. 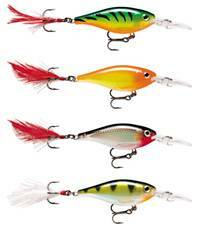  Smaller sizes perfect for perch and chub. 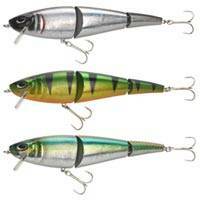 The Rocket Sniffler is a subsurface, 3 joints bait, with a fantastic lifelike action. 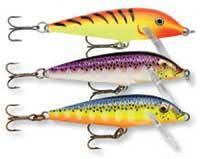 This is a must have lure when it comes to shallow fishing, over weeds, for example. Equipped with high-end treble hooks for an outstanding catch rate! 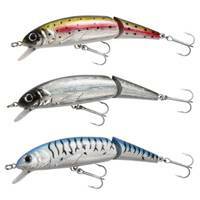 Cast and retrieve and watch the fish attack instantly, perfect lure for bass and pike fishing, ball bearings within the lure give it noise as well as its classic action. The Abu Hi-Lo Floating is unique amongst wobblers. With its adjustable lip vane, you can decide the depth you wish to fish. Along with a newly designed locking lip mechanism, the all new Hi-Lo will never unintentionally adjust while fishing. The new lip can hit the water and bounce off cover while consistently maintaining the desired position. Hi-Lo attracts predators like Pike and Zander, whilst the smaller sizes are perfect when hunting specimen perch. It's here now! The Killer wobbler that was first manufactured in the 1960's. 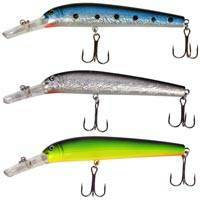 This proven lure has many predators on its conscience and has been many anglers favorite over the years. You can recognize the shape and pattern, but this version has a completely new and unique feature - the Fiber Optic. This feature has never been manufactured in mass production before. After a long field test period it's now proven that this feature has a beneficial effect on your fishing - you simply catch more fish. Fiber Optic reflects daylight and that is resulting in strike points, and this triggers the fish to attack. 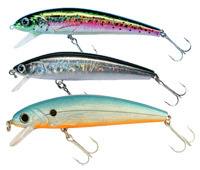 With its slight exaggeration of Rapala's unique baitfish-in-distress behavior, the Jointed is ideally suited to the extremely slow retrieve required to trigger sluggish, finicky fish. Extra noise and action produced by the jointed body helps wake up the fish in poor visibility. The exaggerated action of the jointed body allows a slower retrieve to trigger sluggish or finicky fish. 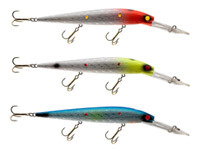 Near neutral buoyancy with a very slow rise  the X-Rap Jointed Shad will suspend when fished with a steel leader providing a very natural wounded baitfish action. The wide side flash and the noise from the body joint guarantee that this lure wont go unnoticed even in murky water and low light conditions. 5 6.2g low water plugs.